I teach a calculus class. It’s the first time that I’ve done that. I have a story about them. Yesterday, I introduced the idea of limits, which, according to them, was the first time any of them had ever had limits discussed in any way in a math class. After a short lecture-style introduction about the basic idea of limits, the notation, and some anecdotal comments, I unleashed them on this handout. I was not going to collect handout. I wasn’t going to fasten any points to this handout. They knew both of those things. I gave them 12-15 minutes to try the handout. This is where life gets interesting. About 6 minutes into the time, I began walking around to look at some work. There are 23 students in the class. I estimate that 17 of them had, for as many as 10 minutes had done zero math, but had done a fantastic job of transferring the table from the handout into their notes. I was flabbergasted. They had spent 10 minutes drawing a table. These calculus students (who, by most traditional metrics represent the most confident and talented math students in our student population) wouldn’t try the math. Their years of math class “success” had thought them two things that created this scenario: A. Stay busy, or at least look busy. Teachers get mad at students who sit around. And B. The only answers worth writing are correct answers. If you don’t know the correct answer, don’t write anything. After about a 5 minute pep talk, they tried, and much to the surprise of most of them, most of their attempts where actually correct answers. And make no mistake, this isn’t just calculus. This isn’t just the traditionally-successful math students. Anyone who has taught a math class has seen students who know that they don’t know how to solve a problem and would much rather leave the problem blank than put something down that is wrong. The wrong answer seems worthless. It seems that we have conditioned our students into thinking that an answer on a page is an opportunity for judgement. If they write something on the page, I’m going to have the final say whether it is right or wrong. Wrong answers are bad. Grades go down because of wrong answers. This mentality would prefer to leave an answer blank. At least if it is blank, you can pretend that you simply need more time. Instead, we should be showing our students that an answer on a page is the beginning of a conversation that ends with them learning something new. It could be that the answer on the page confirms that they have already learned (which makes for a short conversation). It could also be that the answer on the page demonstrates that more learning is needed, and the answer on the page is the window into the confusion, clues to the misconceptions or the missing understanding. When learning is incomplete, perhaps the BEST thing a student can do is show us his or her very best wrong answer. But first we have to teach our students that anytime they put what is in their heads on paper, there is value. There is value in a correct answer and there is value in an incorrect answer. It’s true that they are valuable for different reasons, but they push toward the same end. The authentic learning of mathematics. Perhaps if we can reestablish the value of an incorrect answer, we can do something about this incredibly pervasive fear of trying. So, I’m finding that I am becoming hooked on showing student work back to the students for them to explore as an opportunity to develop a deeper understanding of mathematical topics. But I’m learning there are a couple ways to handle this situation. … and ask if the reflection is right or wrong. Which would activate a certain type of thinking. But it is a short and stifling line of thinking, especially when you consider that most hand-drawn student work isn’t perfect so “wrong” is the most likely answer. Then it risks becoming an annoying knit-picking session, which might have a negative effect on engagement. That question opens up a lot of potential thought-trails to wander down. As I did this activity with students today, the class settled on three criteria for rating these reflection attempts. 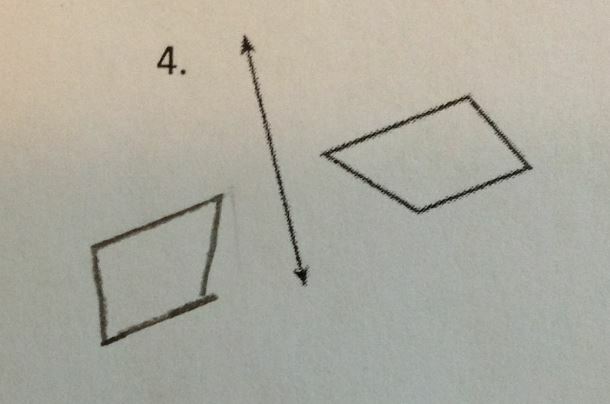 The first is that the image and pre-image should be congruent. Attempt A won that battle (with B at a close second). The next thought was that the image and pre-image should be the same distance away from the line of reflection. Attempt B was the closest (with D pretty good, too.) 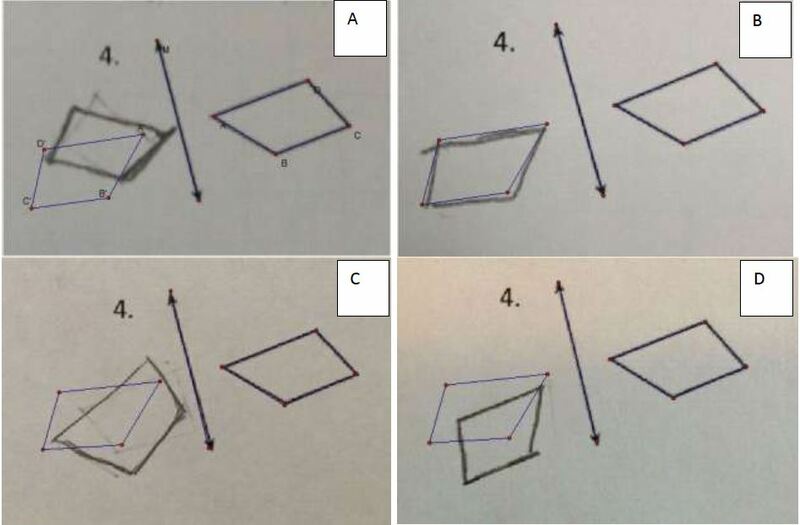 Finally, the students thought that the segment connecting the image/pre-image pairs would should be just about perpendicular to the line of reflection. Attempt B took that contest quite comfortably. The students concluded that attempt B was the best reflection and I was able to confirm that by showing them this photo, which seems to agree quite strongly with that conclusion. If you want to try this activity, go ahead. I’d love to hear some feedback on how it went in your class. I’m still dealing with some quality control issues with some of my multi-media projects, so I apologize for that. I didn’t notice it to be too distracting when I was showing it to the students, but there is still room for improvement. Where is the horizontal half-way line? By the time they get to me, the students in my calculus class have been given a chance to master a whole lot of math. Typically, though, they haven’t been exposed to many situations where the main challenge of the task is figuring out which types of mathematical tools will best model a problem, and thus, drive the method used to solve the problem. Take, for example, the problem described here. This is a wonderful, challenging little task that seems so fascinatingly simple and yet becomes quite complicated quickly. 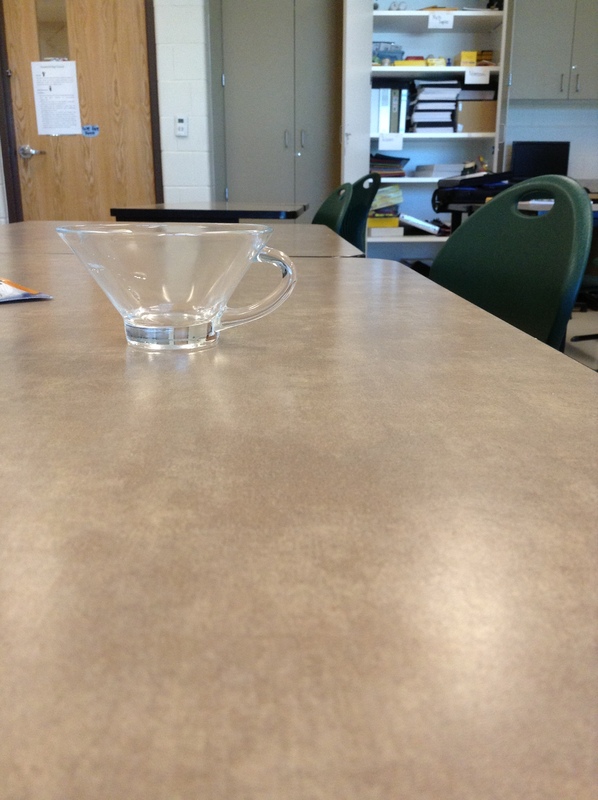 The task: draw a single horizontal line on the cup that represents the half-way line by volume. Almost as soon as I asked the question, you could see the wheels start spinning in the heads of the students. Some took measurements and prepared to “calculate” it. But did they need a formula? How would they find it? What the heck kind of shape is this thing anyhow? 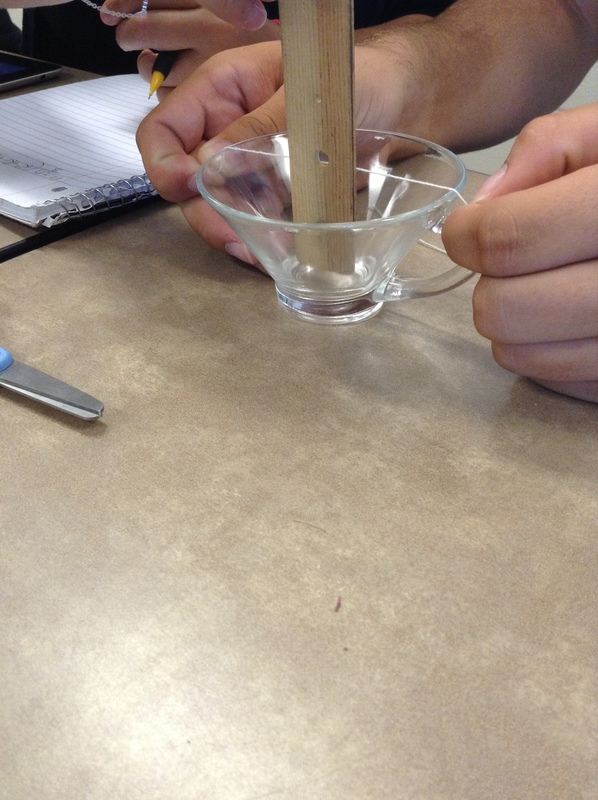 How can we be sure out measurements were accurate? Some were going to draw it onto paper. But how to they model it? Can they use a 2-D cross section? Which cross section do we use? What do we do with it now that we have it? Some figured to guess and check. I mean, the half-way is probably going to be somewhere in the middle. There’s not THAT many different values, really. But what do you guess? Do you have to guess more than one thing? How do check your guess to see if it is right? 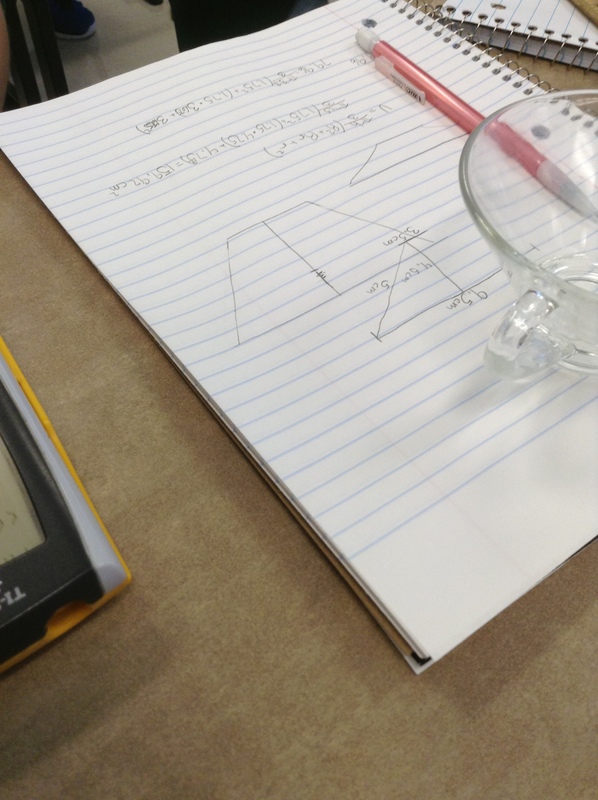 And all groups had to deal with the question: When you have finished up the work on the page or on the calculator, how do you accurately transfer it back to the cup? So, let’s get it out into the open: being able to mathematically model a problem that exists in your hands with math that has always existed in a book is not something that comes naturally to most people. In addition to the content, students need to practice modeling the mathematics. They need to learn what the book math looks like when it is in their hands. Jo Boaler (Stanford Math Ed Professor) has a wonderful line about this. “…students do not only learn knowledge in mathematics classrooms, they learn a set of practices and these come to define their knowledge. If students ever reproduce standard methods they have been shown, then most of them will only learn that particular practice of procedural repetition, which has limited use outside the mathematics classroom” (pg. 126, see bottom for proper citation). It’s as if the math experiences we are giving most students in class are the kinds of experiences that will do them the least good outside class. 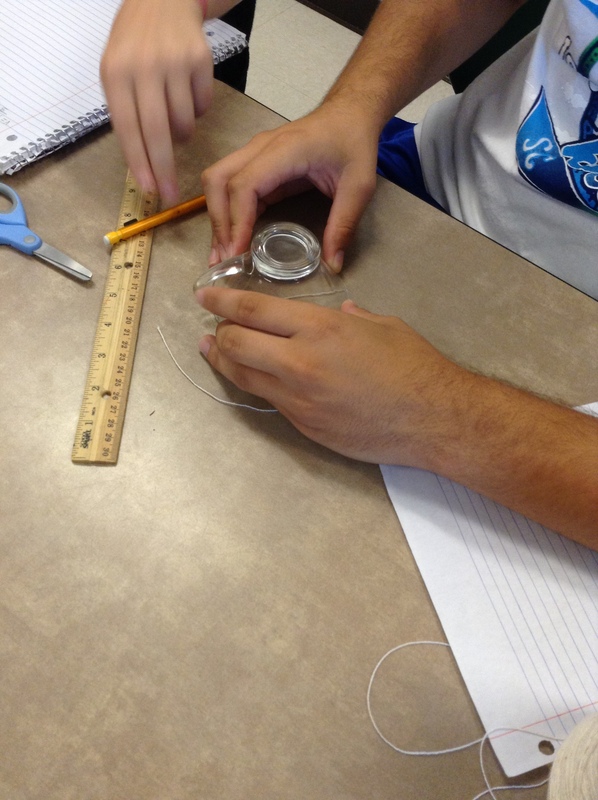 Authentic mathematical modeling requires giving students a task with a simple and clear goal and then letting them decide what kind of math will help to complete the task. The decision is an incredibly important part of the process. They must recognize the variety of available tools, have to choose which ones will work, and of those ones, which one is the best choice. 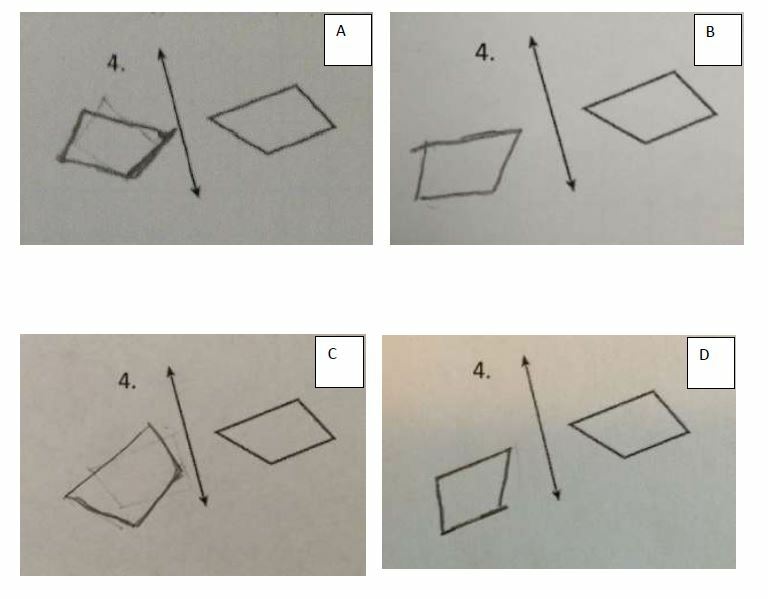 The #MTBoS is doing a great job of providing tasks of this kind of a nature (Like here, for example… or here, as another example). They are plentiful, well-done, and FREE! Give them a shot and see what happens. We owe it to our students to provide them opportunities to take the math off of the pages of the book and let them see what it looks like when it shows up in their hands. Boaler, Jo (2001). “Mathematical Modelling and New Theories of Learning.” Teaching Mathematics and Its Applications. Vol. 20. No. 3, p 121-128. In my previous post, I presented Act I of a 3-Act geometry lesson that I called Bankshot. I also called out to the #MTBoS to support me by offering feedback of which I received two excellent comments that were rich in suggestions, particularly in the aspect of improving the student experience. If you want to go back and look at the first draft and/or read the comments that got left, then feel free to check it out. Now, all three of us agreed that the action begun and ended too quickly. Danny Whitaker (@nemoyatpeace) suggested that I slow the video down. In addition to agreeing with Danny’s suggestion, Dan Meyer (@ddmeyer) suggested that there was more I could do to set the situation up and make the clear what was going on before the I roll the film. Danny also suggested that I cut the film before the ball bounces into the wall. Another interesting suggestion that Dan made was to include multiple attempts. I thought that those are both interesting suggestions. You will see my attempts to respond to the feedback in this second draft of “Bankshot”. I start with a more direct set-up of the situation. I also added a second attempt from when I was filming to give the students something to think about. Now they have at least four guesses they could make. “Both hit target,” “both miss target,” “first hits, second misses,” or “first misses, second hits.” You will notice also that I slowed the playback down which cost us the sound. It’s possible that a bit of background music will be needed in a third draft, but that is something that we can talk about. All right, #MTBoS, here is my second draft of “Bankshot.” I look forward to more feedback.